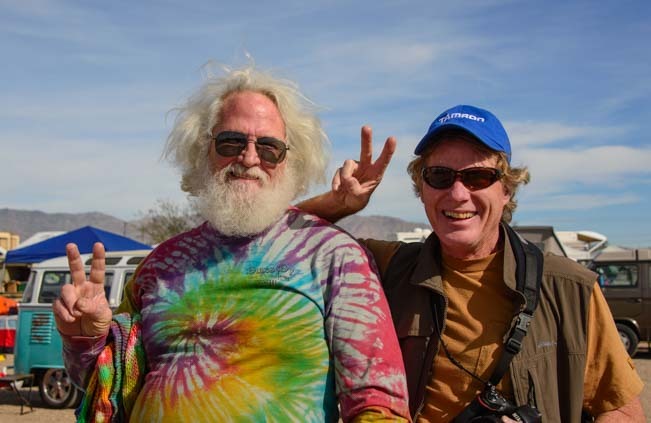 January, 2015 – We started this year’s travels by heading to Quartzsite, Arizona, where the campfires are hot and the beer is cold and the RV madness is in full swing. 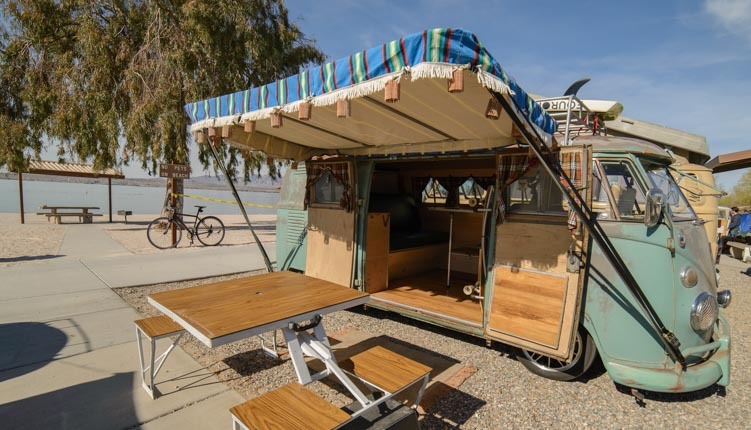 The RV show doesn’t start until today, so yesterday we took a day trip to Lake Havasu to see the unusual RV rally of VW microbuses Buses by the Bridge. 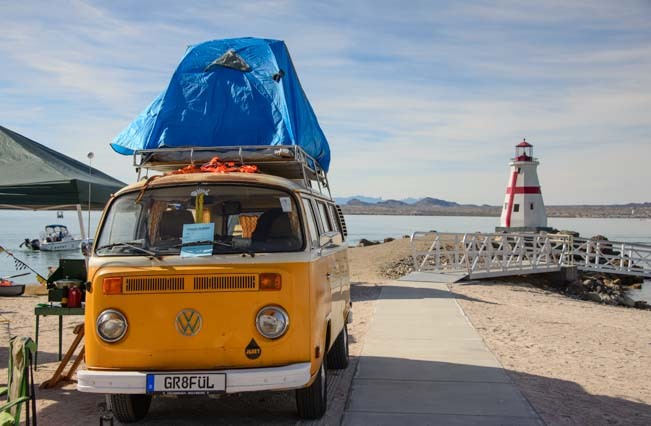 VW buses are gathering from far and wide this weekend in Lake Havasu State Park, and we just had to see the show! 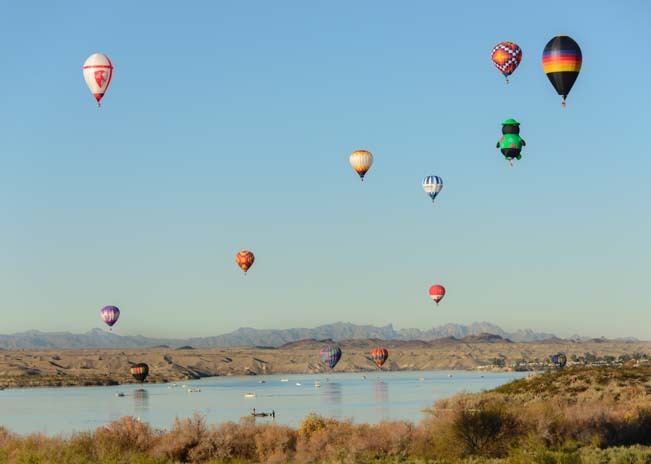 What a surprise to see balloons flying overhead as we arrive in Lake Havasu! We left for town early in the morning and were somewhat bleary eyed as we crested the hill just south of the city. What a shock it was to look up and see dozens of hot air balloons in front of us, drifting across the sky over the lake! A few balloons almost skimmed the water. We quickly pulled over to take pics. Balloons were everywhere. They were flying high overhead and dipping their baskets down towards the water between the boats too. We watched them with delight and were soon joined by lots of other folks holding their cameras and phones up to get a shot. It’s a bird… it’s a plane… it’s Planet Earth! “What the heck is this?” I asked the guy next to me. He said it was the opening day of the Lake Havasu Balloon Festival. What total luck! We came looking for hippie vans and ran into a balloon festival by accident! They began to land after a while, so we continued on to the VW bus festival at Lake Havasu State Park. Microbuses of every year and in and every state of reconditioning (or disrepair) and in every imaginable style were lined up all around a field and along the beach. Everyone was camping out for the weekend, and the weather couldn’t have been more perfect. 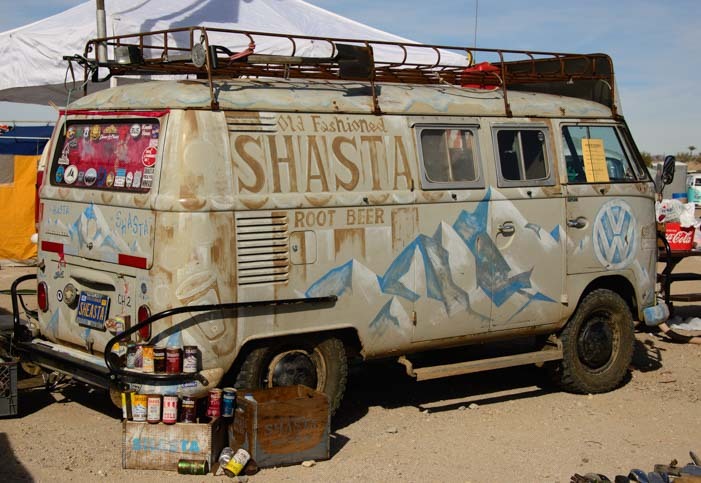 Awning out and doors thrown wide, this VW is ready for some beach camping! Some buses have been perfectly restored and others have aged gracefully. Vintage coolers and picnic baskets and antique popup tent campers and camp chairs filled all the spaces between the mini rigs. Volkswagon van lovers were hanging out everywhere comparing notes on their buses and showing off their very cool mods and restorations. Everyone was reveling in a bit of nostalgia for years gone by, whether they had lived through those years themselves decades ago or had just heard about them from parents and grandparents. I was enchanted by the Genie Bottle, a microbus with a submarine hatch that was the predecessor to the Westfalia style pop top vans. 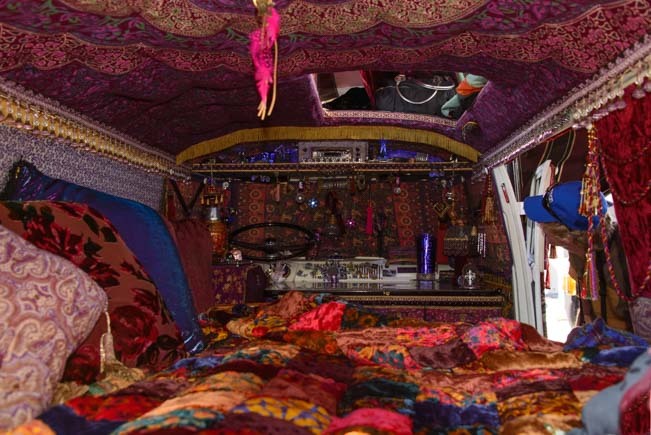 This was a true “Shaggin’ Wagon.” The owner, Nancy, had decorated it entirely in soft vintage materials from the 1950’s, using rich red and purple hues, and her husband, Mark, had lowered the floor so he could install a waterbed! A waterbed in a VW microbus. What next?! A young girl gets totally into the hippie spirit. Lots of grizzled, grey bearded VW bus experts were selling spare parts of all shapes and sizes. 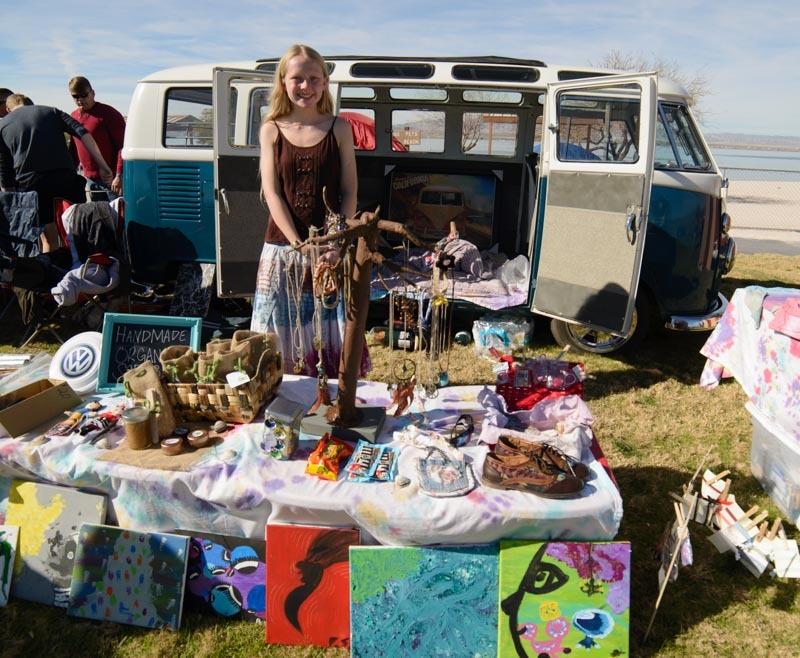 More surprising was seeing a beautiful 14 year old modern day hippie girl with a long tie-dyed skirt, long blonde hair and bare feet selling paintings she’d made in front of her family’s VW bus. Mark was startled to turn around and find himself face to face with Jerry Garcia. He is alive and well and living in Lake Havasu. 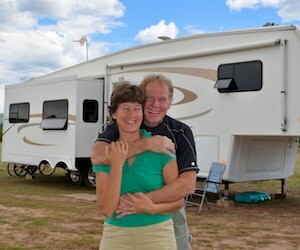 These folks are totally into their little buses, and one fellow even had a very cool six pack of beer called “Big Blue Van” which is brewed in Lake Havasu!! How fun! We looked for it in the stores later but didn’t find any. 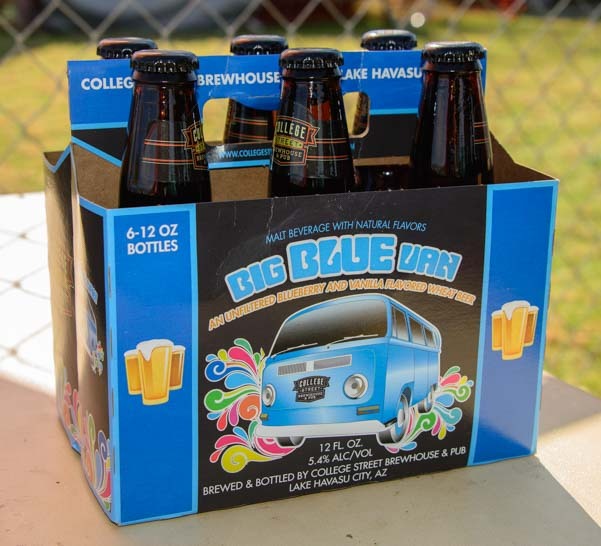 Now we’re talkin’ — local Big Blue Van beer! 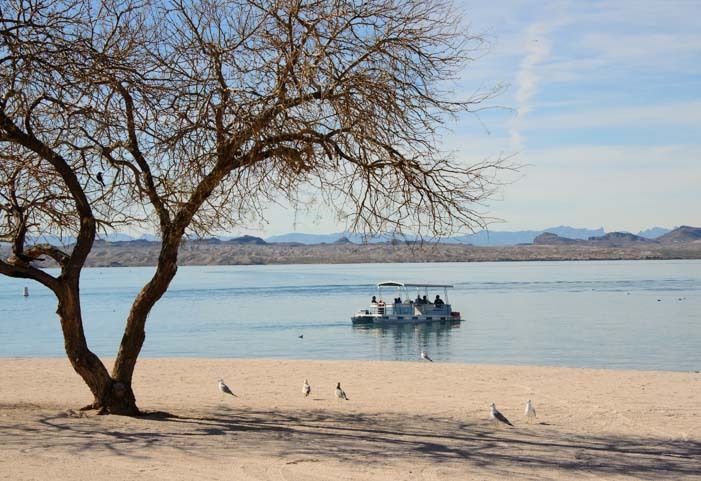 We’ve been to Lake Havasu before but have never gotten down to the beach. White sand had just been brought in recently, and the beach was so inviting. What a spot for a picnic! Life’s a beach in Lake Havasu Arizona! Here’s a great way to take in both the balloons and the buses! An ultralight buzzed the crowd and then flew off over the lake. What a perfect day this was — our favorite kind of day: carefree and full of unexpected encounters! 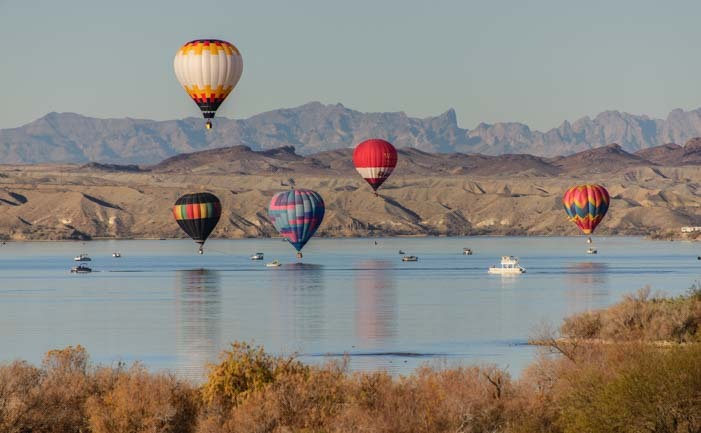 If you are in the Lake Havasu area in Arizona, both the Havasu Balloon Fest and Buses by the Bridge are going on all weekend January 17-18, 2015, and the weather is going to be ideal — sunny and warm!! 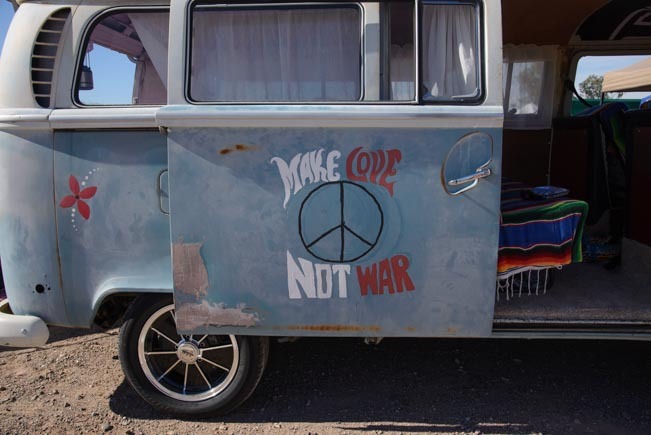 It’s a “FLXIBLE” – We spot a unique RV on the road. This entry was posted in Arizona and tagged Arizona, Arizona Northwest, New, Special Events, Travel, USA, WP Travel by Roads Less Traveled. Bookmark the permalink. I love the photos of the hot air balloons! so beautiful. I’ve heard there was a famous balloon festival in Albuquerque but didn’t realise they were in Arizona too. The shag-pad van is very Austin Powers! groovy!! There’s another annual balloon festival in Yuma, Arizona, in November and we got a big kick out of going to that one year (see the “related posts” links above). Plus, if you hang around I-17 north of Phoenix, just south of Anthem, you’ll see balloonists floating around on winter mornings when the air is cool, especially on weekends!! Air balloon rides is the best ride I have ever experienced. I love being on high places and found satisfaction through this way. 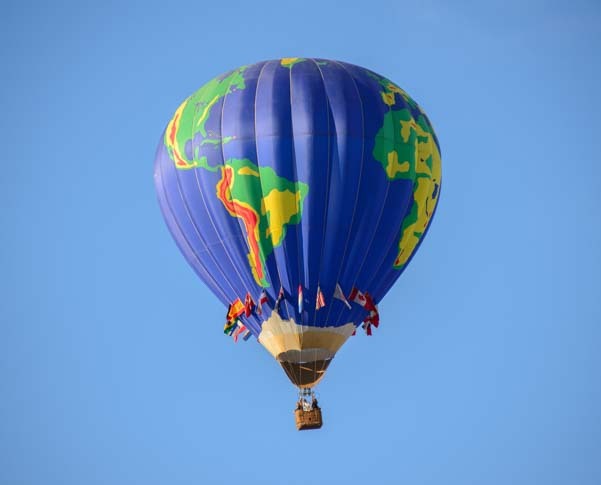 I have been looking to different states to see where is the best place to ride an air balloon and would give me the chance to see more beautiful view.